Dodge City’s Kelan Newton passed for almost 200 yards in a 44-6 win over Wichita Southeast. Tre Griffin rushed for 87 yards in the Golden Buffaloes’ loss. Garden City took a tour of Bixby, Okla., falling 32-27 on the road. Garden City’s Greyson Tempel rushed for four touchdowns, but the Buffaloes turned the ball over three times in the first half. Behind an offensive line that features prized recruit Braden Smith, Olathe South rushed for 222 yards in a 33-20 win over Lawrence. Olathe South quarterback Jake Seurer also passed for 219 yards and four touchdowns. Senior running back Preston Weigel rushed for 105 yards and a touchdown as Hays edged Junction City 27-22. The Indians built a 14-0 lead at halftime, but a turnover and a safety in the third quarter allowed Junction City to take a 15-14 lead. Weigel and Ty Whittington responded with touchdown runs to give Hays a 27-15 lead. Mill Valley held off Manhattan 26-21. Mill Valley sophomore Logan Kock ran for 192 yards and two touchdowns. He also completed 4 of 5 passes for 78 yards and two touchdowns. Pittsburg cruised past Labette County 42-2. Purple Dragons junior Alex Barnes scored four touchdowns, rushing for three and scoring another on a fumble return. Barnes finished with 191 yards rushing on just nine carries. Andover Central blasted Valley Center 49-7. The Jaguars put on an offensive clinic, as Andover Central quarterback Blake Meier completed 9 of 10 passes for 214 yards and two touchdowns. Ryan Banwart had more than 100 yards receiving, and Lucas Milner ran for more than 100 yards and three touchdowns. Blue Valley West quarterback Ryan Ralston passed for two touchdowns and ran for two more in a 35-7 win over Washburn Rural. Ralston completed 5 of 10 passes for more than 100 yards. The Jaguars’ Grant Garcia added 185 yards on the ground. Andover’s Steven Young ran for 171 yards and three touchdowns on only eight carries in a 41-12 win over Haysville Campus. Miles Starks opened Andover’s scoring with an 87-yard kickoff return. Topeka Hayden fell behind 13-0 to Centennial League rival Topeka Seaman, but the Wildcats rallied for 20 second-half points to win 27-16. Senior running back Zach Smith rushed for 116 yards and a touchdown. The Vikings built the early lead behind a touchdown run by quarterback Ryder Chaffee and a touchdown pass from Chaffee to Joe Reagan. Seaman coach Blake Pierce was taken to a local hospital at halftime of the game where it was determined that he suffered a mild heart attack. Pierce is expected to make a complete recovery. Congratulations to the Santa Fe Trail Chargers which ended an 18-game losing streak with a 28-22 overtime win over Royal Valley on Friday night. Junior quarterback Weston Gloss tossed a 14-yard touchdown pass to Cody Vandevord in overtime to propel the Chargers to the win. Santa Fe Trail had stopped Royal Valley on fourth-and-short on the Panthers overtime possession. Gloss threw for nearly 200 yards and four touchdowns; three of which went to Tyler Mundy who had six catches for 134 yards. Cole Holloway rushed for 213 yards and four touchdowns as Tonganoxie outscored Lansing, 58-42. Senior quarterback Tyler Ford added 171 yards and a score on the ground while passing for 126 yards and two touchdowns. Tonganoxie lead 52-20 after three quarters before the Lions scored 22 fourth-quarter points. In Central Kansas League action, the Hesston shutout Halstead 20-0 to usher in the Clint Rider era as Swathers head coach. Hesston senior quarterback Wyatt McKinney completed 14 of his 21 pass attempts for 251 yards and a score. Ryan Schadler led the Swathers with 172 yards on the ground and a pair of scores. Hesston fell to Halsead in last year’s operner, 32-26. Lakin built a 26-0 halftime lead in rolling to a 38-0 shutout of Syracuse. The Broncos were led by senior running back Gage McAtee who rushed for 124 yards and three touchdowns on just ten touches. McAtee also had two receptions for 46 yards and a fourth touchdown. Wichita Independent opened play in the Central Plains League with a 61-33 win over Medicine Lodge. Panther senior quarterback Jordan Reed, who transferred from Rose Hill in the offseason, led Independent with 143 yards rushing and five touchdowns. Fellow senior Karson Rowe added 125 yards and a score for Independent. Council Grove had little trouble with Herington in their Flint Hills League opener. Coach Lee Weber’s Braves scored the game’s first 57 points in beating the Railers 57-6. Sophomore running back Keegan Honas led Council Grove with 114 yards rushing. Senor Lane Evans rushed for 42 yards and three touchdowns, while quarterback Tanner Langvardt who contributed 135 yards of total offense and a pair of rushing scores. Rossville scored 48 points in the first half in dispatching of Chapman, 55-8. 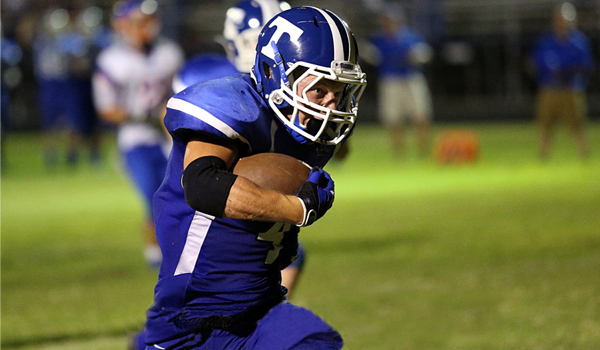 Tucker Horack rushed for 109 yards and three scores for new Bulldog coach Derick Hammes. Rossville will take on another Class 4A opponent this week when the Bulldogs travel to Abilene. Senior quarterback Alex Gomez threw for 250 yards and four touchdowns as Elkhart beat Turpin (Okla.) 44-13. Justin Hurn caught seven passes for 178 yards and three scores. Gomez added 84 yards rushing and another score. He is one of nine returning starters on each side of the ball that have the Wildcats thinking about their first playoff berth since 2009. Gomez threw for 2,048 yards and 24 touchdowns a year ago. Valley Heights edged Valley Falls 30-24 in overtime on Friday night. The Mustangs got big rushing performances from seniors Cole Maddox and Derek Trimble. Maddox rushed for 182 yards and a score, while Trible added 172 yards and two touchdowns. The Mustangs got a bit of revenge on the Dragons who won last year’s meeting 28-26. Bennington kicked off the 2013 seeason with a 60-20 win over Whitewater-Remington. Fullback B. J. Glanton (6-2, 269) rushed for 146 yards and four touchdowns to lead the Bulldogs. Junior quarterback Kyle Kieborz added 111 yards and two touchdowns on the ground as Bennington outscored the Broncos 44-6 after the first quarter. Chase County posted an impressive 42-15 win over Osage City in a game played at Welch Stadium on the campus of Emporia State University on Saturday night. Bulldog quarterback Troy Higgs passed for 174 yards and three touchdowns on the night. His primary target was junior wideout Brendan Watts who had seven receptions for 172 yards and three touchdowns. Osage City was led by senior Drake Whalen who rushed for 94 yards and a score. Yates Center ended a 23-game losing streak with a 48-22 win over Sedan in coach Ben Wiehn’s debut. The Wildcats are now just 5-77 since the beginning of the 2004 season. Yates Center’s last win came on September 24, 2010, 52-28 over West Elk. The Wildcats host West Elk this week. St. John and Otis-Bison played to a 28-28 first half tie in Central Prairie League action on Friday night. The Tigers took over in the second half outscoring Otis-Bison 36-16 en route to a 64-44 win. Schuyler Brown rushed for 202 yards and five touchdowns to lead the Tigers. Preston Miller passed for 178 yards and two scores for St. John. Kole Urban led the Cougars with 168 yards rushing and three touchdowns. Urban also returned two kickoffs for touchdowns. Sophomore quarterback Alex Perez passed for 170 yards and a pair of touchdowns as Udall beat the newly formed Argonia-Attica Titans, 30-12. Perez’s classmate Nolan Williams caught five passes for 99 yards for the Eagles. Udall could only muster 76 yards rushing on 43 carries against the Titan defense. A&A was led by Alec McDaniel who passed for 144 yards and two touchdowns. The Titans had negative yards rushing on the game. Hoxie opened their season with a 54-6 win over Tribune-Greeley County. The Indians were led by junior running back Connor Katt who rushed for 164 yards and three touchdowns. Senior quarterback Chase Kennedy completed two of his three passes to Tyler Kaus for 25 yards and a score. Hoxie will take on Sharon Springs-Wallace County in Week 2. Southern Cloud built a 22-8 halftime lead over Frankfort and held on for a 30-22 win. The Warriors were led by senior quarterback Ryan Perkins who completed 14 of 20 passes for 203 yards and four touchdowns. Perkins, a Kpreps 8-Man II all-state selection last season at defensive back, led Southern Cloud with 20 tackles and a forced fumble on Friday night. Jase Suther rushed for 124 yards for Frankfort and Lucas Adams added 94 yards and two scores. Waverly scored 20 points in each of the second and fourth quarters to top rival Lebo, 40-28. Senior Austin Bailey rushed for 172 yards and four touchdowns on 29 carries and had 27 receiving yards and a fifth score among his two catches. Lebo was led by quarterback Jake Gould who threw for 134 yards and three touchdowns. South Barber exploded for 22 points in the third quarter to get past Pratt-Skyline, 46-20. Junior Peyton Yandel rushed for 120 yards and three touchdowns and passed for 86 more yards. Dylan Allison added 102 yards rushing and two scores for the Chieftains. Dustin Weber rushed for 206 yards and two scores for Skyline. Sophomore running back Nolan Lowry rushed for more than 100 yards and three touchdowns as Stockton slipped by Hill City, 30-24. The young Tigers won their opener over Hill City for the second consecutive season after beating the Ringnecks 22-18 in 2012.